You’ve got to eat it fresh, it looks beautiful, it tastes really strong and it reminds me of fun times trying to catch them in the summer from a very young age. I also love sashimi, or meat and seafood that is lightly cured, smoked or marinaded rather than cooked outright. 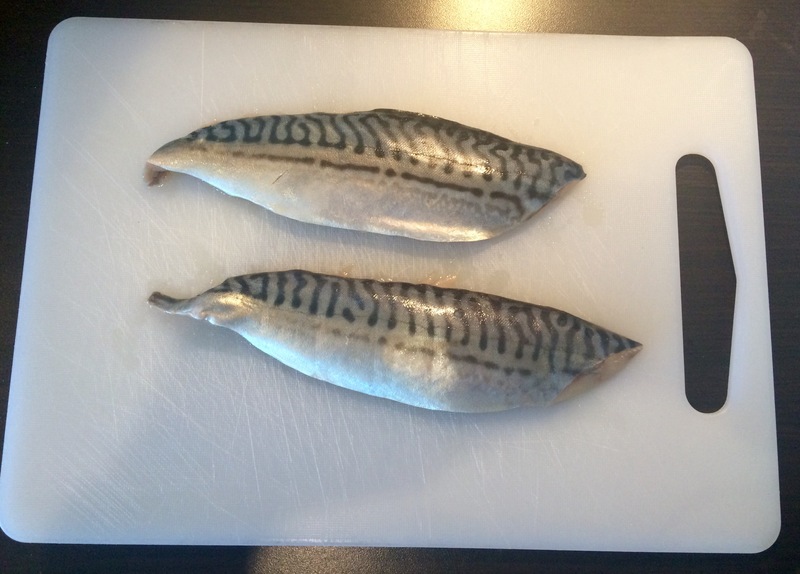 So here is a simple recipe for preparing mackerel to eat, without the use of a cooker. 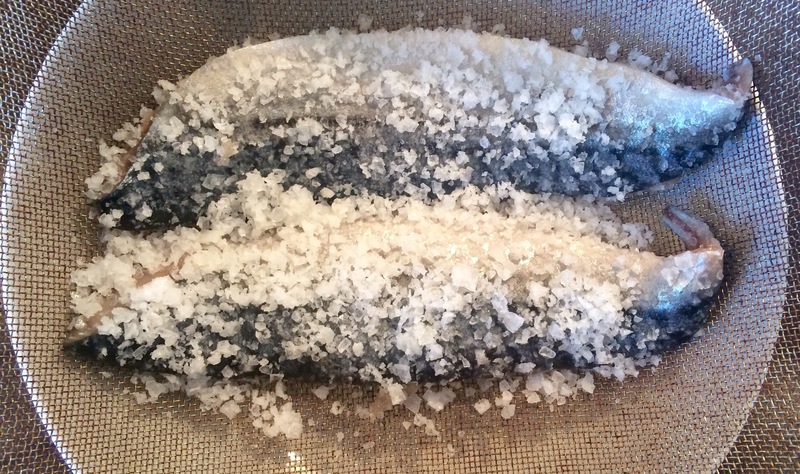 Put the mackerel fillets in a container and cover them with the 4tbsp salt, making sure that no parts are left uncovered on either side. Transfer the fillets to a sieve and place it over some sort of container to catch any of the liquid that the salt will draw out. 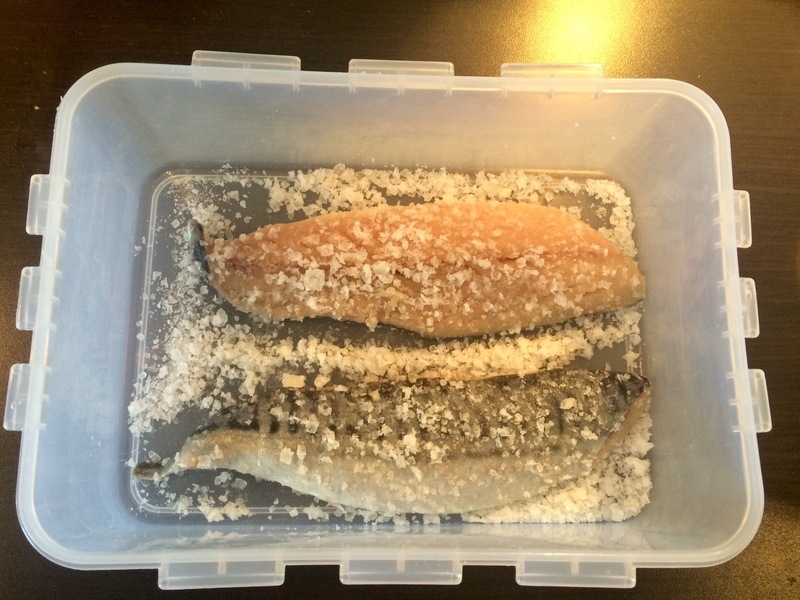 If you’re left with any salt in the container sprinkle it over the top of the fillets. Leave the fillets on the sieve for an hour then carefully take each one and rinse it under a cold water tap. Make sure the tap is not set on high pressure or you could damage the fillet. Carefully dry off the fillets with kitchen towel. Find a sealable container. It should be able to hold the two fillets and when filled with the liquid mixture you are about to make it should cover both the fillets. Mix together the vinegar, mirin, optional vermouth and extra pinch or two of salt. Stir so that the salt dissolves. Pour a little of the mixture into the sealable container. Lay the fillets in the container flat, side by side then pour over the rest of the vinegar mixture. Seal the container and put it in the fridge for 3 hours. Take the fillets out of the container and carefully dry them with kitchen towel once again. You will notice that the flesh has become more firm, almost as if the fish has been cooked. It feels like a drier version of ceviche. The next step can be quite satisfying once you get over the fiddly bit at the beginning. 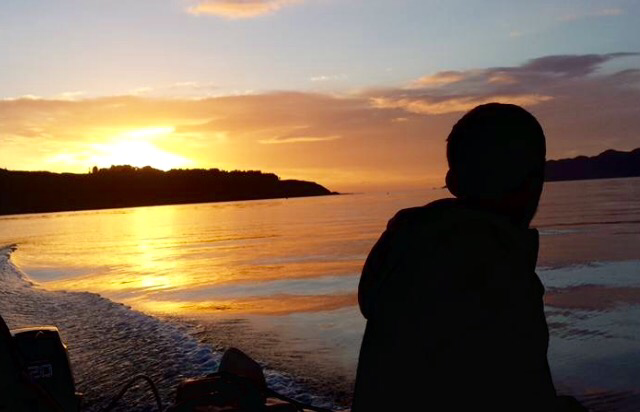 Start at the top end of the fish and find yourself a bit of the skin to hold on to. It’s sort of like trying to peel back a new piece of sellotape. 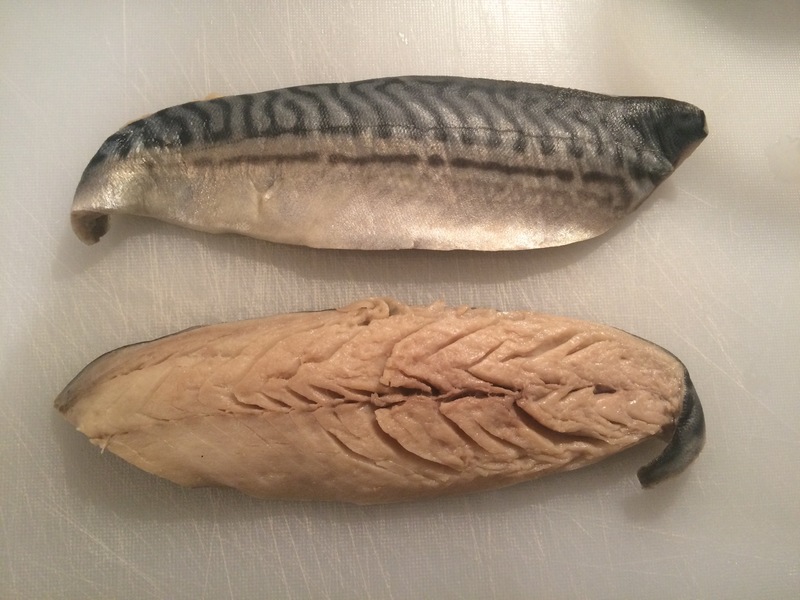 Once you’ve peeled back a bit, gently pull the skin off all the way along the fillet. Some of the iridescence will inevitably come off but don’t worry. This is normal. Next, turn the fillets flesh-side up. Look carefully and feel along the middle groove of the fillet for any bones. Gently but firmly use a pair of tweezers to pull the buggers out. This task is less satisfying than peeling off the skin but it’s worth it, if you want to avoid having to give (or receive!) the Heimlich manoeuvre later on. The fillet is now ready for the final serving stage. There are several options here. 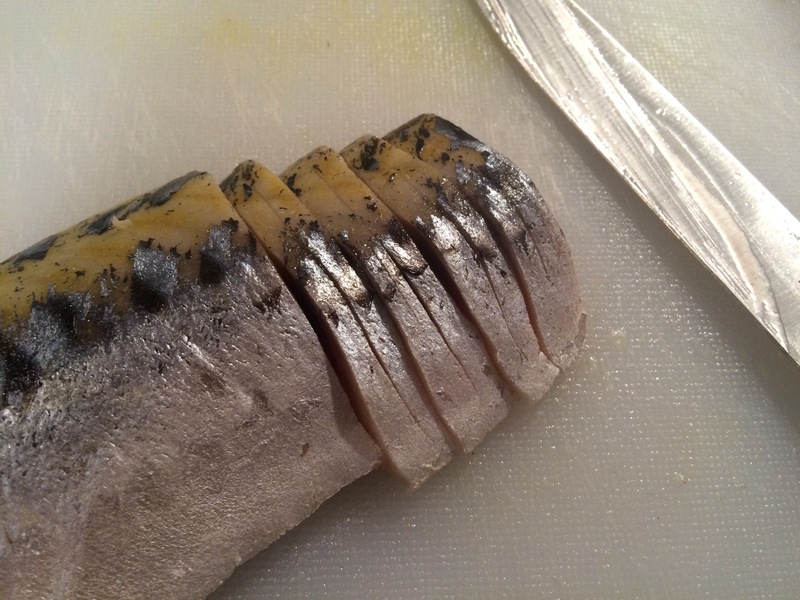 It could be served as a simple sashimi piece, it could be pressed onto sushi rice to make battera or sliced into sticks and made into maki rolls. 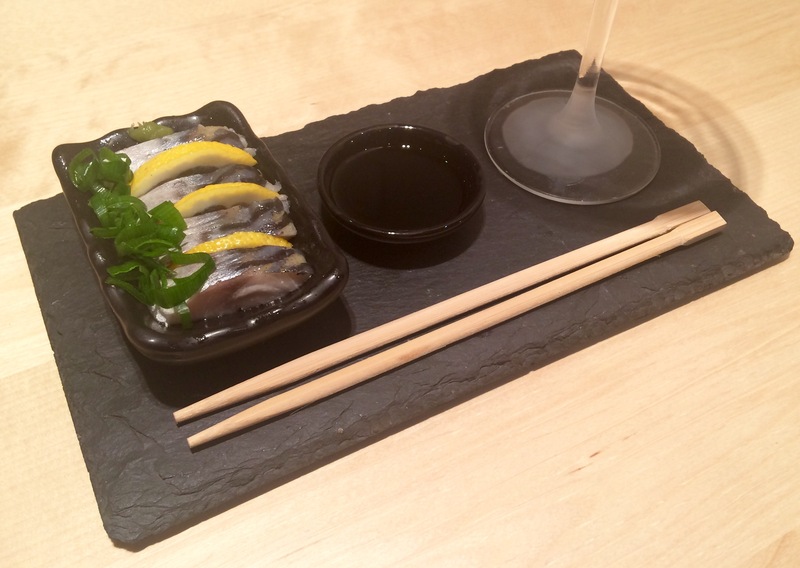 For this post I opted for a low-carb option and served it as a simple sashimi. 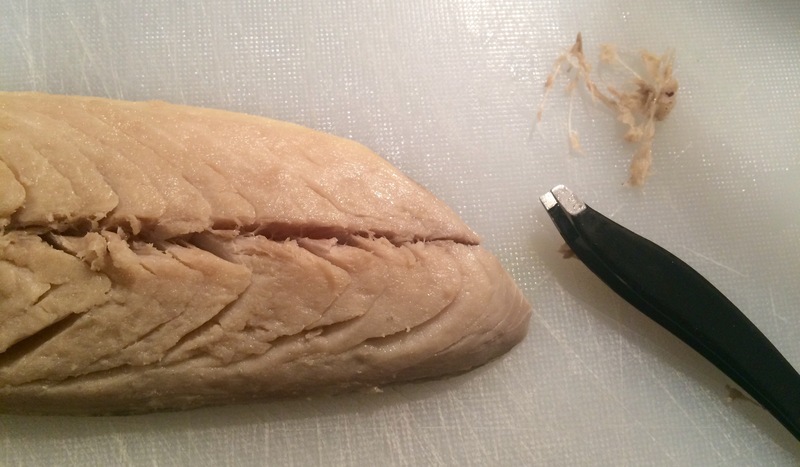 I sliced the fillet into 4-5mm pieces, with a thin groove cut deep into the middle of each one. This groove allows the fish to soak up a little more sauce when you dip it. You can serve it like so with chopsticks and some dipping sauce. Soy sauce on its own is fine but for Shime Saba’s strong, oily taste I like to mix half soy sauce with half fresh lemon juice. 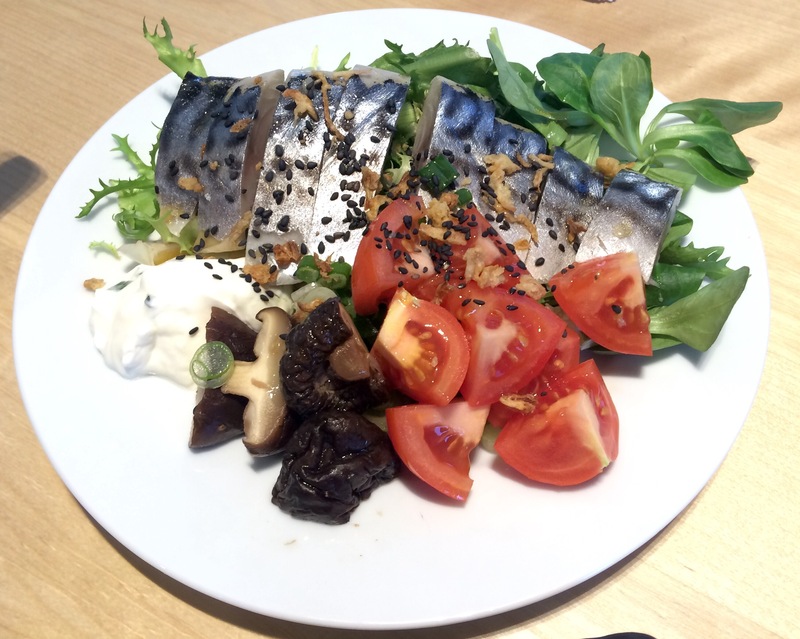 I also served the mackerel here with cucumber tsukemono, grated fresh ginger (to help cut through the oily fish) and some simple shredded spring onion, with a dab of wasabi. Note that this is a very nutritious dish. It’s a much better drinks accompaniment than crisps or peanuts! You can also serve it as a lunch or other meal. It keeps for at least a day in a sealed refrigerated container. I love how the blue skin colour contrasts with the salad. 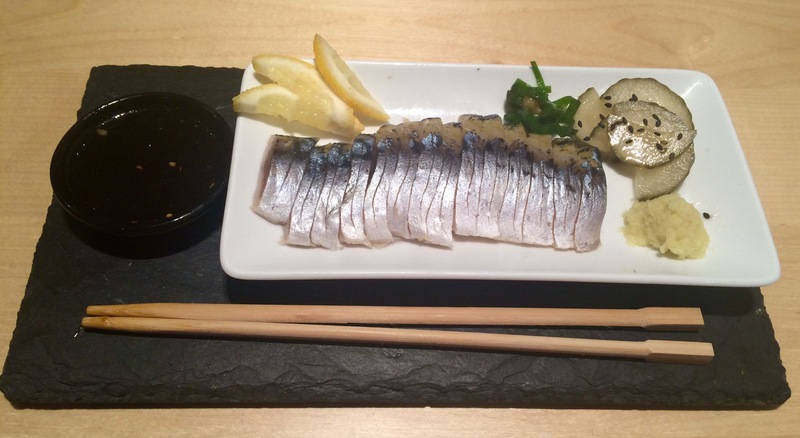 You can also serve the shime saba with small slices of lemon between each piece. 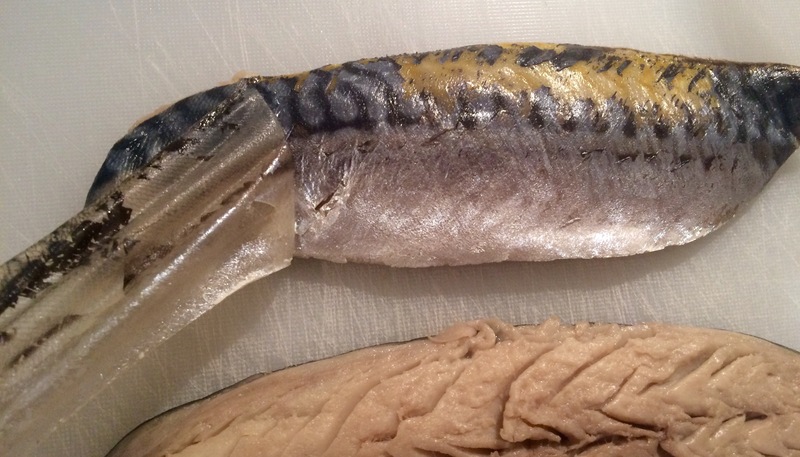 Not only do the colours contrast nicely but again, the sharp citrusy lemon cuts against the oily fish. And what else goes well with lemon and seafood? Obviously a martini. I would recommend a classic martini with lemon peel, not olives. Alternatively you could try my nice winter warmer the Japanese Pickled Ginger martini.